Do you enjoy eating fresh garden lettuce through most of the summer? 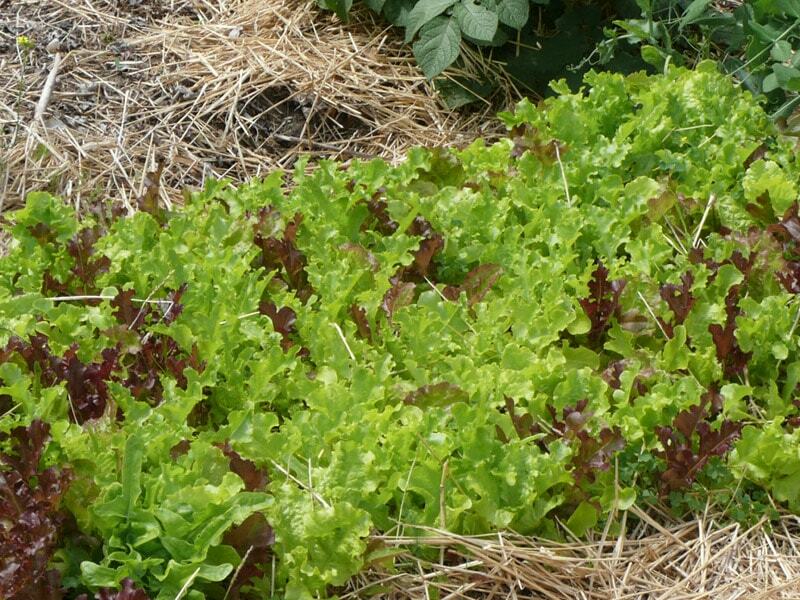 One of the secrets to accomplishing that lettuce-lovers-goal is to plant numerous varieties. Each variety can perform a bit differently. 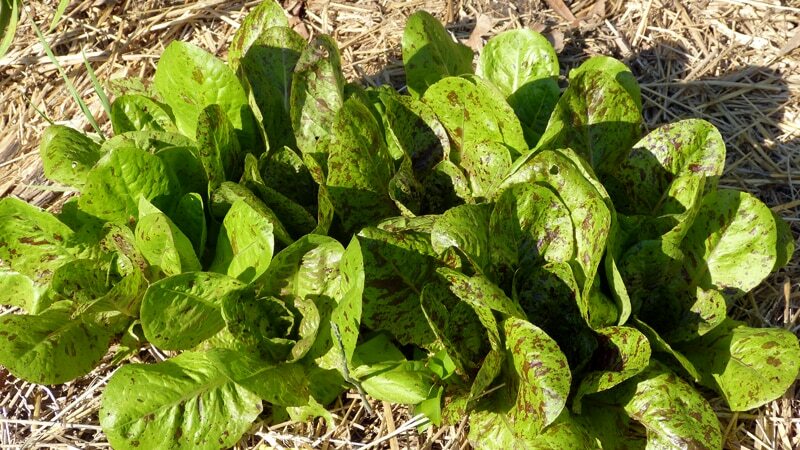 So as variables (like temperatures, humidity, rain fall, etc) change, you want to have at least one or more lettuces that are still performing well enough to maintain the good taste you want. I usually grow at least a dozen or more varieties just for that very reason. About 7 or more are must-haves for me. Then I try several new varieties to see if I can discover another favorite. One of the first that I plant in the spring, this 150 year old lettuce is a dependable loose leaf heirloom that performs well when other lettuces won’t. Even as things heat up and it starts to stalk, I can still get eatable leaves, especially after a rain. (See my post Lettuce – Secrets to Getting Eatable Lettuce Well Into Summer. This year I’m going to try Simpson Elite which is touted as an improved Black Seeded Simpson with even better taste and an extended harvest time of about a month. Young Black Seeded Simpson that was directly sown into the garden with a few stray seeds of red lettuce. .
Be sure to put the varieties Green Ice and Green Grand Rapids on your list to try as well. They’re similar to Black Seeded Simpson, but each has a different color and slightly different taste. One of the most beautiful and delicious of the crisphead group. It is light, crisp, and can really make a salad outstanding. 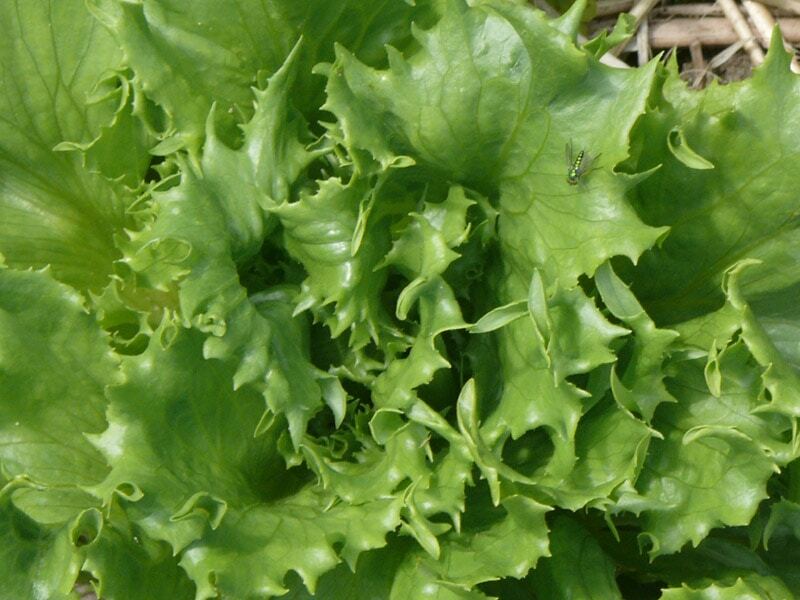 Although it will make a head similar to iceburg lettuce, I harvest it like a loose leaf lettuce to enjoy on a daily basis. Reine des Glaces lettuce. It tastes as good as it looks. As many pictures as I’ve taken of this lettuce, I can’t find one to use in this post. What a shame, because it makes a beautiful large rosette of bronze and green oakleaf lettuce that I’d love for you to see. Pretty enough to grow as an ornamental. 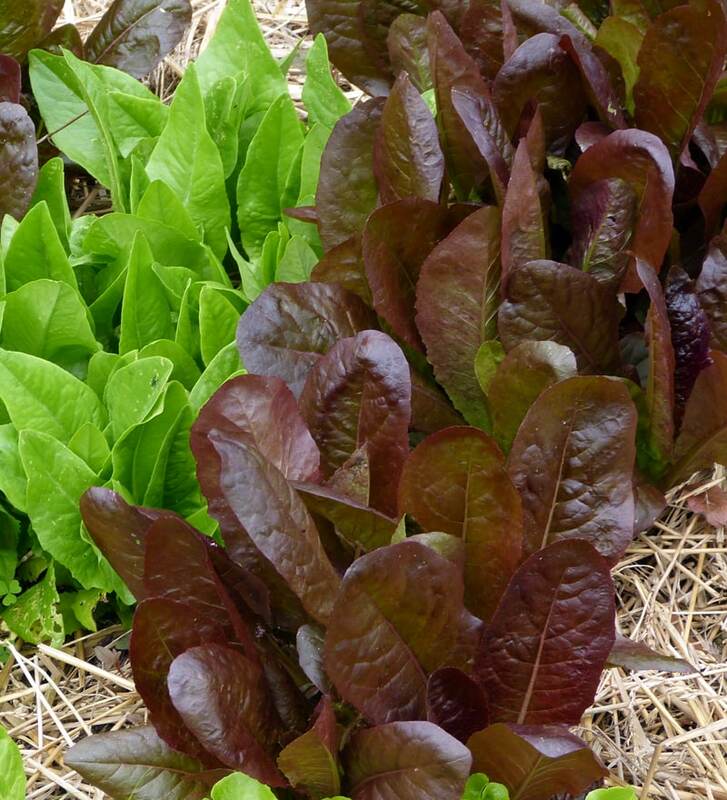 It’s a mild tasting lettuce and makes a beautiful bed for other foods and won’t compete with the other flavors. I also like to include a green oakleaf lettuce like Antares. It was new to my garden last year and I was very impressed with how it held during the heat of summer. Supposedly, there is a difference in these two lettuces, but I certainly can’t tell it. They look, taste, and perform the same to me. It’s seldom that lettuce gets a chance to head in my garden, since I graze it each day. But this romaine makes a picture perfect head of lettuce if you let it mature. This heirloom dates back to the 1700s. That was it’s original appeal for me. I continue to plant it because it often does well when other varieties are not performing their best. Nice taste and forms a loose head of triangular leaves. Gorgeous in the garden and worth planting just for its beauty. I especially enjoy the young leaves in salads. By the time its mature, I have other favorites that I’d rather eat. Outredgeous Red Romain and Green Deer Tongue on the left. 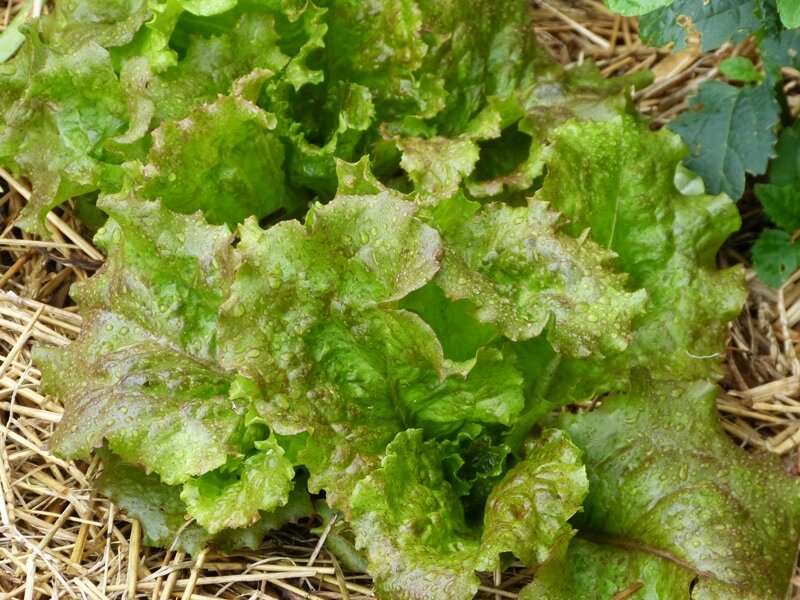 I’ve had this loose leaf lettuce in my garden every year for about 36 years. Great used as baby lettuce. Stands the heat and is slow to bolt. Good in cool fall temperatures as well. The good taste of one of its large red-burgundy-over-green ruffled leaves after a rain in the hot summer can amaze you. Young red sails lettuce. As it ages the burgundy becomes more pronounced. Anuenue – An Hawaiian lettuce that stands the heat. Jericho – A Romaine from Israel that stands the heat. Tennis Ball – A small loose butterhead that was among Thomas Jefferson’s favorite lettuces. Crispy Frills – Beautiful in the garden and in the salad. Head has fan-shaped leaves and frilly top like frisee. If you’re a big lettuce fan like I am and want great tasting fresh-from-the-garden lettuce well into the heat of summer, planting numerous varieties is one of the secrets to getting it. Thank you for all the information. It is so nice to know how you like the taste and how well it does in your garden. Does the crisphead group mean it is crisp lettuce? My husband likes the texture of iceberg lettuce. Yes, Sue, the crisphead is crisp lettuce. If your husband likes the texture of iceberg lettuce then he will really enjoy the Reine des Glaces. Also the Sierra Batavia might be very appealing. Thank you for your rundown of lettuces and letting us know how they perform for you. I have been hearing from others about how they love the tennis ball lettuce. I am looking forward to trying your favorites. Toni, glad to hear that you’ve heard good reviews on Tennis Ball. I can hardly wait to grow it. Thomas Jefferson wrote that he liked it because it required so little attention and was one of the best of the bib type lettuces. Let me know how you like the ones you try that are also my favorites. Fun to compare notes. Tom Thumb is my favorite–you can pick the little head out of the middle and it’s a perfect salad size for one. Enjoy! Thanks for this Julie! It’s a great tip for singles and also for those of us who want something a bit unique. Would you please tell me where you purchase your lettuce seeds? Thank you. Various places Sue. Pinetree Garden Seeds, Annie’s Heirloom Seeds, Diane’s Seeds, Fedco, Southern Exposure Seed Exchange, Johnny’s Select Seeds, St Clare Heirloom Seeds, Bountiful Gardens, Baker Creek, and Sustainable Seed Co. Also High Mowing Seeds. Thank you for this post on growing lettuce. Wonderful information and I love the pictures. Last year I had great success with Black Seeded Simpson and Grand Rapids. This year I’m adding Red Sails, Capiton, and Red & Green Deer Tongue. I can’t wait for fresh garden salads. One question I have is how do you direct sow lettuce in the garden? Do you pull back the mulch and scatter seeds and then cover them back up or do you wait until they germinate before mulching? Mouthwatering photos! I loved Skypos this winter, it did well in the cold for me. I’m trying TanTan as a new lettuce this year, there are so many to try and compare. Glad to hear of your success with Black Seeded simpson and Grand Rapids Kevin! You’ve chosen some good additions for this year too. And yes, Kevin you pull back the mulch and scatter the seeds. The rest of your question I addressed on p 193 of my book. Also it may be helpful to review the post Mulching Your Fruits, Vegetables and Perennials. The answer in short: Where you have sown small seed (like lettuce seed) directly onto the soil, a light layer of mulch will allow light, air and rain through, but will protect the seed from washing away in heavy rain. After you plant take some loose straw and “sprinkle” it onto your planting bed to lightly cover it. The seed will germinate and come through the light layer. When they do you may want to “sprinkle” more straw to increase the layer of mulch. Sandra, I googled the Skypos and it’s beautiful. From the picture I saw it looks just like Continuity (Merveille des 4 Saisons) which is considered the most beautiful in the world. I’m going to order some and hopefully taste it this season! Thanks for the recommendation.